Do you ever wonder what makes food taste good? Why changing the way food is cooked can change its flavor? How slight tweaks in a recipe can significantly alter the finished product? Then you’re thinking like a research chef — one who should consider our Culinary Science & Product Development bachelor’s degree program. JWU’s Culinary Science & Product Development program blends the strength of our world-renowned culinary arts programs with the science of food and food production. Discover this unique combination firsthand by designing and developing a food product from concept to optimization. With classes in academic and lab environments, you’ll focus on the core competencies of culinary arts and baking and pastry arts, then expand into product development and food technology. Explore food regulations and labeling, food safety, food processing and more. Then complete a senior-level product development internship to put your education into practice. When you graduate, you’ll be prepared to develop and create food and beverage products that meet the needs of the consumer. Make your food ideas a reality with employers such as Campbell’s, Kraft Heinz Co., Tyson Foods, Dunkin Brands, Land O’Lakes, McCormick, Stonewall Kitchen and a variety of restaurants. 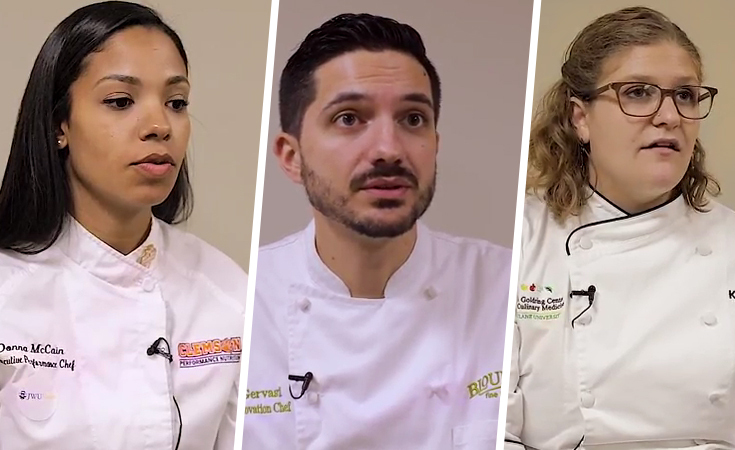 Each year, JWU Experiential Education & Career Services hosts a Culinary Nutrition forum where prominent alumni share how JWU set them up for success. In this 10-part series, they share their top tips for going far in the industry.